County supervisors have passed the budget that will keep the government open from July through June 2020. 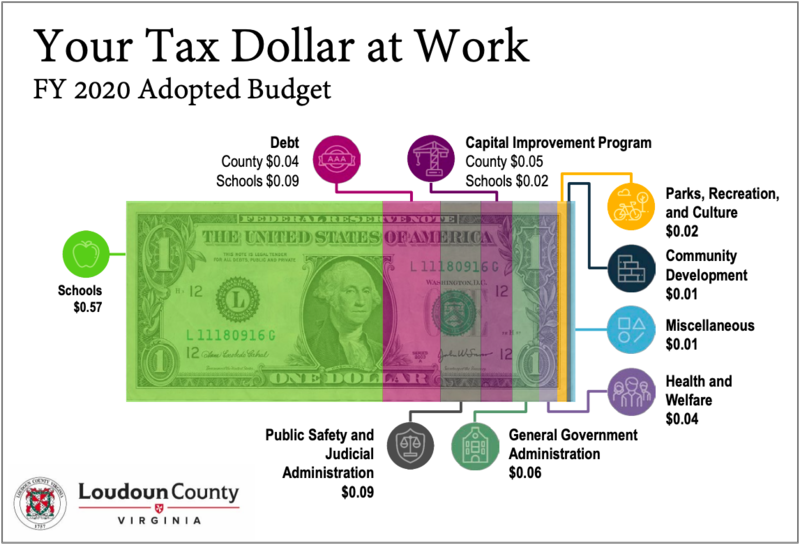 The $3.2 billion fiscal year 2020 budget represents another year of growth in Loudoun—both in the county, and in the county government’s tax rolls and size. Loudouners will see a four-cent real estate tax rate cut, to $1.045 per $100 of assessed value. But not every household will feel that cut, and in fact many will see a higher tax bill, as some areas of the county saw more rapid growth in property values than others. In particular, people in the Ashburn and Broad Run districts and in parts of Sterling may see their tax bill go up. The $1.045 tax rate is the equalized rate, at which the average real estate tax bill stays level despite changing property values. County budget staff members put the average tax bill in Loudoun at $5,100. That will be the lowest tax rate since fiscal year 2008, the last time the tax rate was below a dollar, at $0.96 per $100 of assessed value. This year, the county government will add more than 175 full-time equivalent positions, a budgeting tool used to track the number of positions across the county, including both full- and part-time jobs. According to a county press release, that includes 204 new actual positions overall in 23 different county departments. Those hires will bring the county’s workforce to nearly 4,150 full-time equivalent positions. That does not include the school system, the county’s largest single employer, with more than 10,000 employees. It is the second year of a planned three-year project to catch staffing levels and pay up to the rest of the region and Loudoun’s own growth. In all, the county will channel about $25 million to that project this year. This year, that includes a two percent raise for county employees across the board to get the county closer to pay levels at comparable jurisdictions, costing about $6.1 million, and a 3 percent merit pay increase for some employees, costing about $7.9 million. The expanded staffing still puts Loudoun behind its Northern Virginia comparators in terms of county staffers per capita. Fairfax County’s proposed fiscal year 2020 budget reported 11.04 FTEs per 1,000 residents, Prince William County is at 10.73, and Fauquier is at approximately 10.96. Based on the number of FTEs in the fiscal year 2020 budget, and the county government’s latest estimation of Loudoun’s population, Loudoun will stand at 10.31. More metropolitan districts are further ahead—such as Arlington County, with 17.6 FTEs per 1,000 residents. 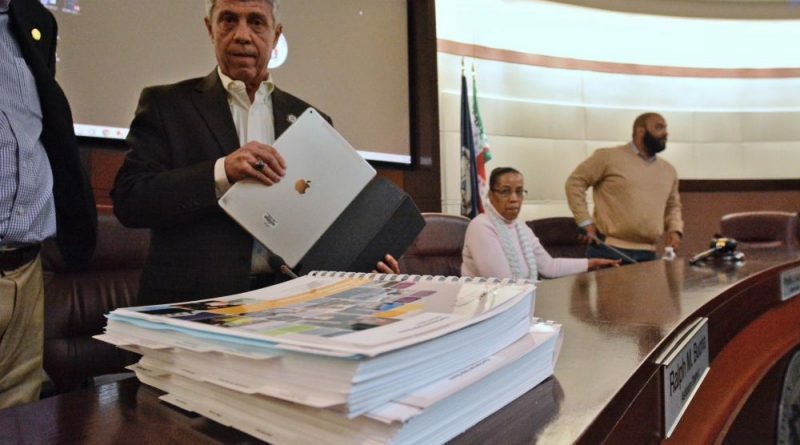 Supervisors had been warned in 2018 that they may be entering the tightest budget of their term, as the county government tried to staff up and the school funding request was expected to far exceed what the county would have available. But instead, County Administrator Tim Hemstreet was able to accommodate every one of the board’s priorities in his proposed budget without a tax increase, with county coffers buoyed in large part by continued, 30 percent year-over-year growth in the county’s data center market. This year taxes on data centers put more than $200 million in the county’s purse. Additionally, the school system’s budget request to supervisors fit within the county’s fiscal guidance, meaning no cuts from the county to the School Board’s request—although the state’s school funding did fall about $2 million short of expectations. The county will send $76.3 million more to the schools this year than last, for a total of $873.7 million in local tax funding for the school system’s $1.28 billion annual operating budget. The county’s six-year Capital Improvement Program, adopted alongside the operating budget, totals $2.4 billion in project funding, 49 percent of which are transportation projects. School projects account for 21 percent, or $521.9 million, of the plan. 77.6 percent of the county’s revenues come from real estate and personal property taxes. Other local sources of revenue, such as fees and fines, make up 16.9 percent of the county government’s funding, and the state and federal governments combined contribute 5.4 percent of the county budget. For every dollar in taxes, 57 cents goes to the schools. Another 13 cents goes to pay debt, such as by bond-funded county or school construction projects. Nine cents goes to public safety and the judiciary, such as the Combined Fire-Rescue Department, the sheriff’s office, and the courts. Supervisors adopted the fiscal year 2020 budget unanimously. I guess we all should be comforted that Phyllis thought saying yes to the budget requests was easy. We shouldn’t notice that the data centers are providing cover for developers increasing residential density. Wasn’t fixing the balance between residential and commercial supposed to be a key theme yet just last week Phyllis and 7 other board members excitedly approved a project with over 23 residences per acre. WESTERN AND NORTHERN LOUDOUN SHOULD TAKE NOTE. We haven’t seen the Metro charges yet, Route 15 north of Leesburg has no long term fix nor does Route 9. Even the Lexington Light on Route 7 is still there but I guess if one only commutes from Lansdowne to Leesburg its an easy commute just like this was an easy budget. Why isn’t the tax rate well under a buck? The state average is about 79 cents. Why doesn’t Howard Hughes, the hospitals, the Greenway and others pay their fair share so our property tax rate can be properly reduced? If the biggest partisan donors paid their fair share perhaps we could also get rid of personal property tax on our vehicles too. I may be a retired lawyer but I don’t see this as a status quo county until the policies are efficient, fair and the full community (especially our non-profit charities) are supported. With better management taxes should go down! Bobby O. Check your data. The Greenway is the single biggest payer of property taxes in Loudoun County.